Daytime temps here in Santa Clara are reaching upper 80s to mid 90s now. Work in the garden starts to slow down since most plants start shutting down in the 90s except for the tropical trees that begin to flourish as long as there is good humidity. Here in CA I have to create the humidity with trays of water under or near the trees. These trays of water help keep the shohin hydrated as well since it become impossible to keep them moist in the summer. I have received several inquires about my gardenia, often referred to as an indoor bonsai by flower companies. So many have received them as gifts this year and need to know more about the care. I am posting the gardenia images from when it arrived to my collection from Brussel’s to where it is today. You will see a huge difference. Gardenia fresh from Brussel’s Nursery. Large pot, very organic soil mix of most mulch and every branch ready to bloom. But not this year. One bloom was allowed for form this year. Then all the blooms were removed as well as much of the branch structure because it was a tangled mess inside. Soil need to be replaced to that appropriate for our area. Gardenia today. New leaves are forming and the tree is back-budding nicely to create a more appropriate branch structure in the future. Pot is a bit strong for this tree but it was more appropriate to the trunk size for now. Trees transplanted today are ficus and schefflera species. These hot weather lovers like to be re-potted in the hot days of summer when their roots and foliage are exploding. I stopped re-potting tropical trees in Fall and Spring many years ago when I found them sulking for too long. Now I only do them in the heat of summer. schefflera, leaf reduction is fantastic and the trunk has been thickening nicely. This will go into a new bigger pot for a while to continue development. 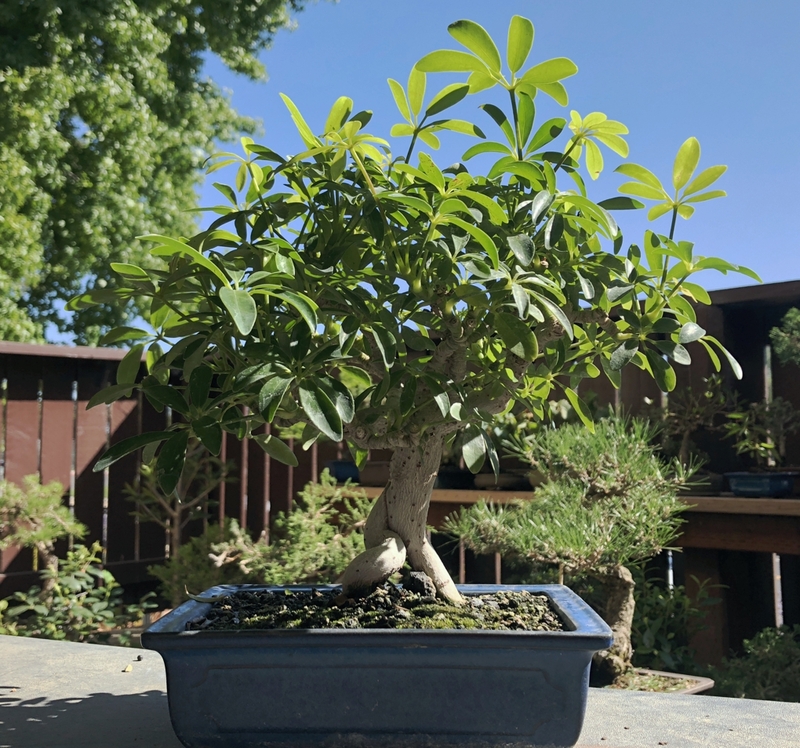 schefflera after re-potting. This new pot will allow for renewed root growth and will lead to larger foliage that I will have to work to reduce again. 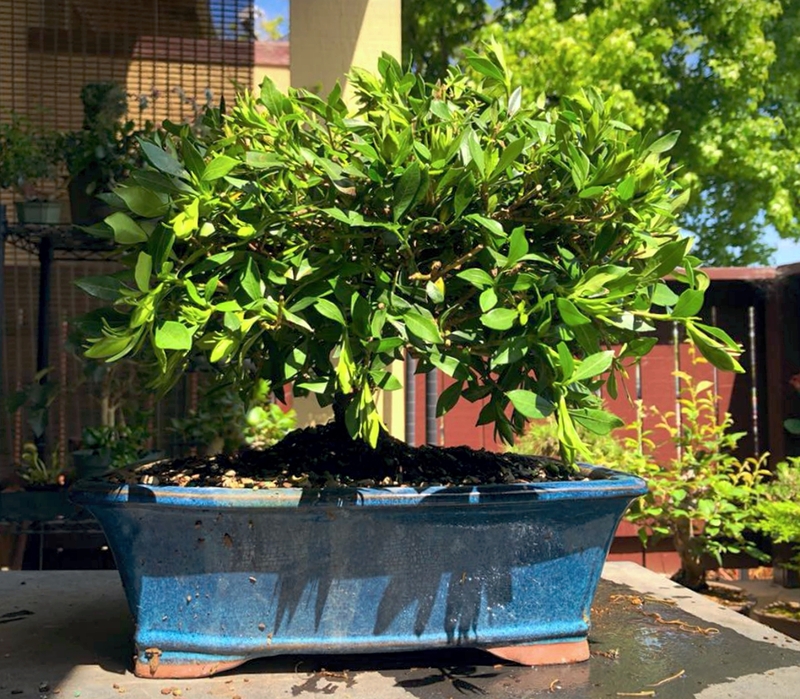 The Ficus Micoarpa was in a small shohin pot as well. 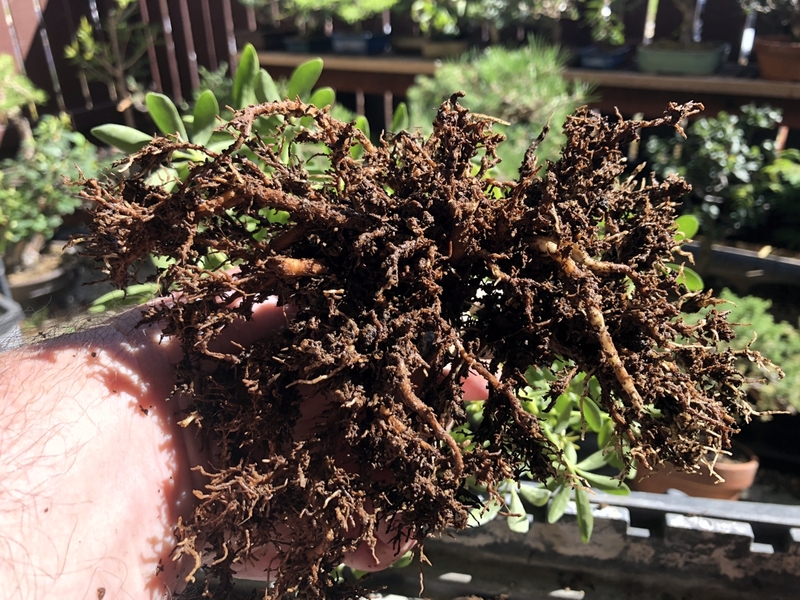 It is time to encourage more root growth and branch development so it was potted in a larger deeper bot to build strength. 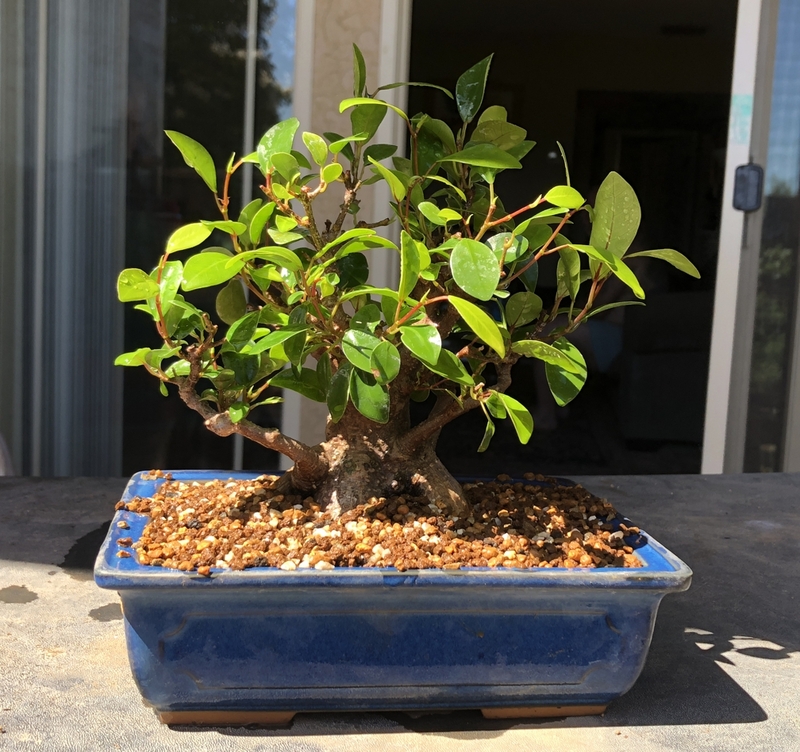 Ficus microcarpa grafted on “ginseng” base. 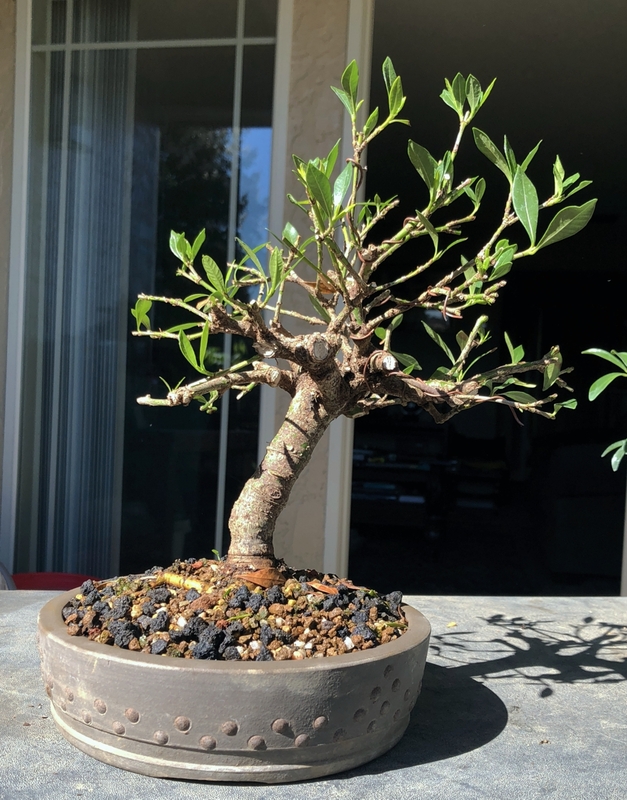 This tree is being moved to a much larger pot to improve root development and foliage mass. It has been showing in a nice shohin pot of many years and it is time to build it up again for a bit. 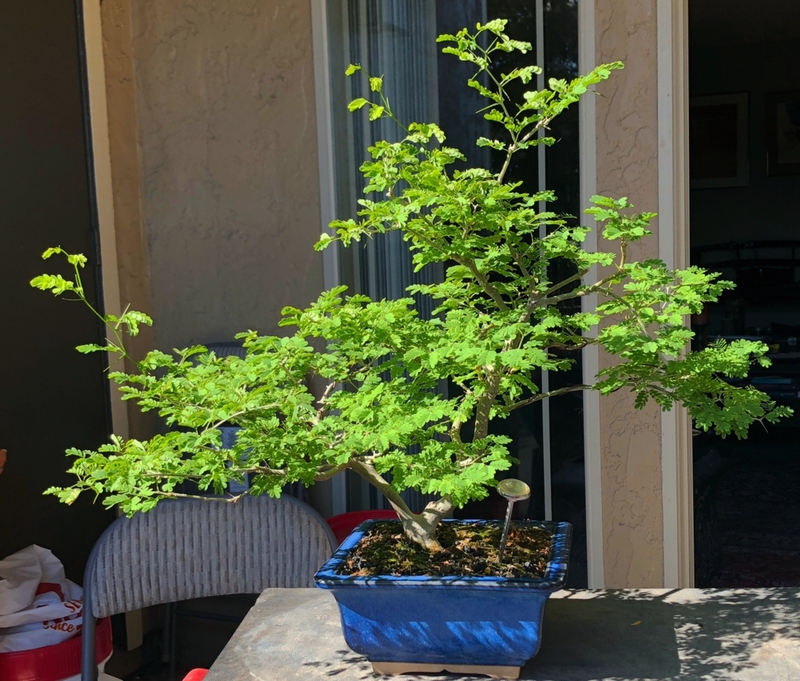 The gem of my summer collection are my Brazilian Raintree and the Trinidad Flame Bush. The flame bush was features earlier this summer when it was re-potted. Now it is grows like crazy creating new branches. 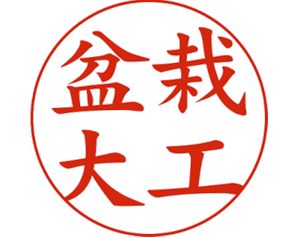 I will introduce it during a demo in July to SBBK in San Mateo. Most have not seen this rare species. The Brazilian Raintree is in its glory now producing spectacular foliage and very long thorns. Sad to say that we have discovered that the trees that develop thorns generally do not bloom. I am not discouraged because the tree is so unique in this area and makes a stunning display. 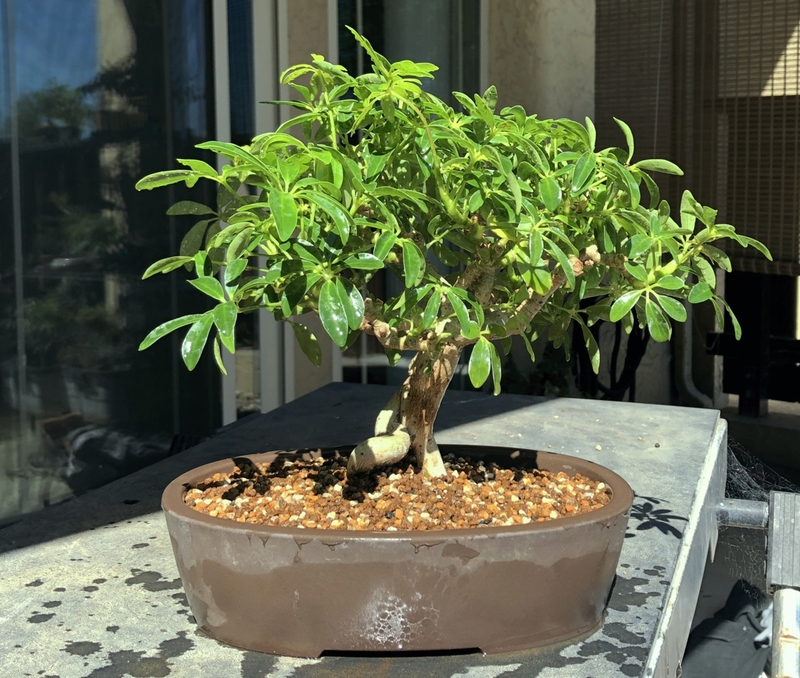 Brazilian Raintree update. Summer is here and this beauty is just putting on the growth.